Thermador vs. Miele in a 48” range is truly a comparison of industry bests. Thermador was the first to incorporate steam and a warming drawer in a professional range. The new (February 2015) Miele has become the first range with a speed oven and a steam assist in the main oven. You will truly like either, but there are key differences as well. We will look at both products and then compare features at the end. 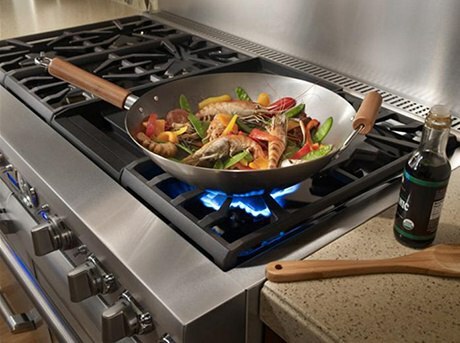 You can then determine the right range for your own cooking style. This is an exhaustive article covering burners, ovens and special features. 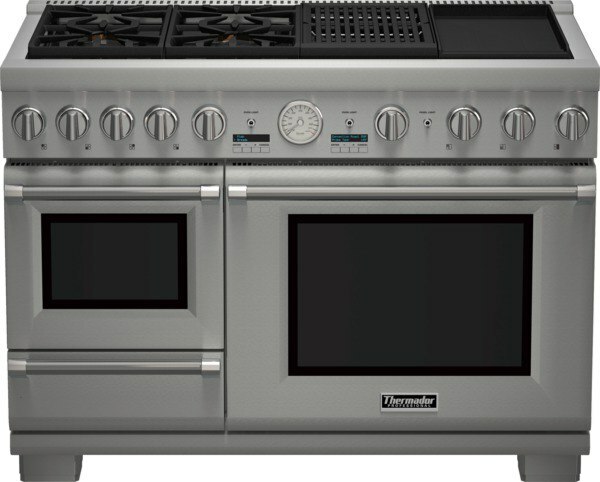 Thermador’s Pro Grand Steam Range is dual fuel with a gas top and electric oven. This unit is unique in that it’s the only full range offering a built in steam, warming drawer and convection oven. Their Grand Series is 27” deep compared to the standard 24” depth, so you can fit more in the oven. This range offers multiple top configurations with 4 burners with grill and griddle or 6 burners and a grill or 6 burners and a griddle (pitcured below). Thermador’s range offers their signature Star Burner. On the Pro Grand series, the front burners will offer a high output of 22,000 BTU’s, compared to 18,000 on their regular 24” depth range. In addition the back burners will all feature their exclusive “ultra low simmer” for temperatures as low as 100 degrees. The brass burners are sealed, raised and sit closer to the grates. The advantage is less heat loss as the burner sits closer to the pan. It is also easier to clean compared to the traditional round burner, which sits on the surface. 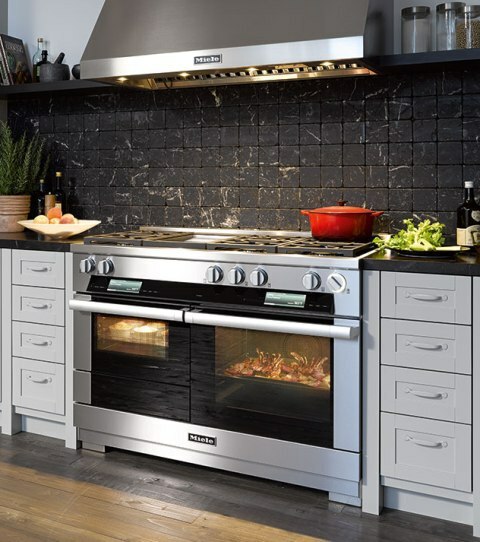 The right oven is not only deep, but it also offers some great features like European Convection, self clean, temperature probe, as well as staggered halogen lighting and three adjustable full extension racks. On the left side, is a fully function steam oven. Steam cooking is healthier, retaining the food's natural nutrients as well as color with less butter and oil. The oven can be used to just steam food, to convection cook, or a combination of the two. Underneath the steam oven is a warming drawer. Warming drawers are great especially for busy families. They are great to maintain the temperature of cooked meals and keeping them ready to serve without the overcooked, dried out or rubbery texture of a microwave. Thermador offers a two year warranty as well as a full range of product. They quite often offer great rebate incentives, like their current free dishwasher promotion with purchase of this range. Miele’s oven is also dual fuel. This oven is the only full range on the market offering a speed microwave. There are also multiple configurations. You can either purchase this with 6 burners and a grill, 6 burners and a griddle or 8 burners. This range is quite the show piece. It sits flush in a 24" depth cabinet and features touch proof stainless, and beautiful black glass door fronts. 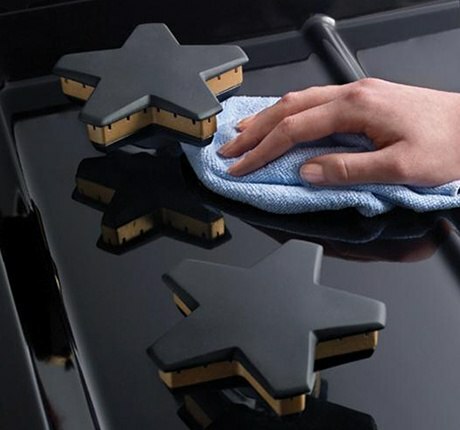 It is visually very appealing and easy to clean. The dual stacked burners are sealed and will reach as high at 19,500 BTU. Dual stacked burners allow for two rings of flame. On low, it’s a smaller flame sitting directly right underneath the burner cap. This is built strategically to act almost like a built in simmer plate, allowing for a low consistent temperature and very even heat distribution to pans. The front knob controls are backlit with white LED lights. In addition the control panel includes a full LCD color screen display with a clock, a timer, multiple cooking modes as well as Miele’s exclusive MasterChef control system. With MasterChef, all it takes are a few touches of a button and the range automatically sets time and temperature, eliminating guesswork from your cooking. It is pretty amazing. This video is powered by Wistia, a video hosting platform for businesses. Learn more about Wistia! The right main oven, offers many features. 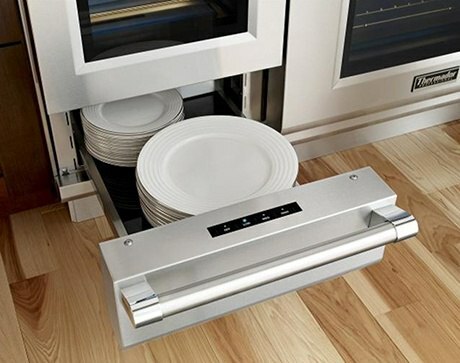 Their oven features two European convection fans, for even more even heat distribution when cooking. As well as a wireless temperature probe, staggered halogen lighting, and three adjustable racks, w/ 1 being a ball bearing. Of course the oven is self cleaning, and a big advantage with the Miele, is you can leave the racks in during self cleaning! (All other brands, anything stainless are supposed to be taken out prior to self cleaning). This oven also can be hooked up directly to a water line and will offer you the ability to inject up to three bursts of steam on any cooking mode. Steam assist is great for adding a little hardness to the outer crusts of breads or the tops of lasagna. Another unique with this range, is the Speed Cook Convection Microwave built into the range. This oven can be used as just a regular microwave, for heating coffee or popcorn. It can also be used as fully functional second oven. It will have all the same cooking modes as the main oven; bake, broil, roast, etc. as well as a traditional wired temperature probe. In addition you have the option to “Speed Cook” on any of the modes. This can cook foods up to four times faster than the traditional method using microwave and convection cycled in combination. Underneath this unit is a warming drawer like the Thermador. Miele offers a one year warranty. If you purchase their hood and range together there is currently an incentive for monies towards a dishwasher. This is a tough call. Like I said initially, these ranges may be the two best products at Yale. 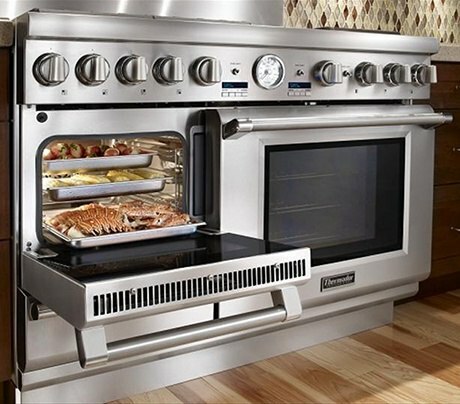 Thermador is larger and deeper, so you can fit more in the oven. Miele, however, will sit flush with base cabinets. The MasterChef is the best control system for a professional oven. Miele is the best in class here. Thermador has 22,000 BTU and the intermittent ExtraLow simmer against Miele’s 19,500 BTU. So if you like to cook larger meals on the burners, then Thermador would be better. I also like the Star burners and their closer position on the stove. 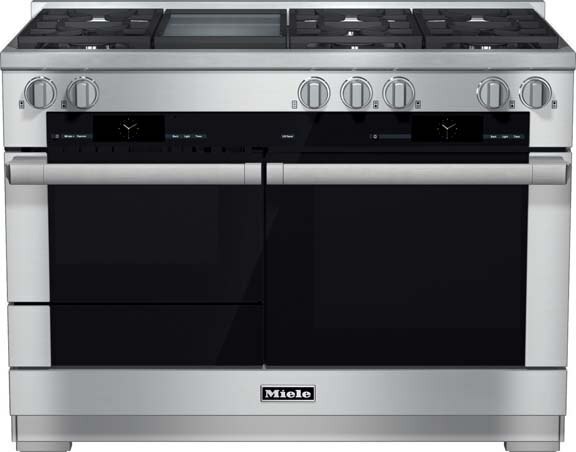 Miele has the steam assist and dual convection whereas the Thermador is a single convection oven. Thermador has a steam oven versus the speed convection oven. 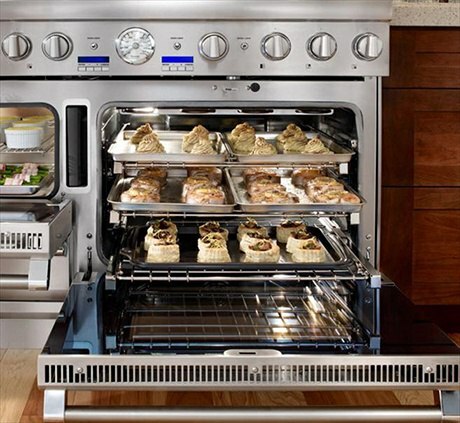 Thermador is a true steam oven meaning you can cook like a regular oven using steam. Miele is a steam assist to add texture or finish foods. They are totally different functions. Miele does have a speed oven or convection microwave, so you can cook as an oven and/or microwave. Overall Miele has more functionality in the ovens. However, it really depends on what you will use. Miele is the most reliable appliance brand on the market. However, they sell mostly dishwashers, laundry and wall ovens. Professional ranges are new category. There probably be some growing pains. Thermador, however, has been producing professional ranges since the 1990’s. As a company, they are one of the most reliable in premium appliances. It really depends on what you prefer and how you want to cook. For sheer power and size, Thermador is the better choice. 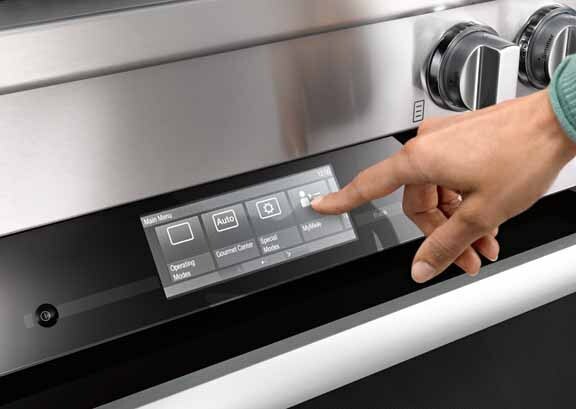 Miele will eliminate guesswork with their superb controls. I love the steam assist for finishing foods as well. It is truly original. Get The Yale Professional Cooking Buying Guide with features, specs and the inside tips to all the brands like Wolf, Capital, Viking, Miele, Dacor, GE Monogram and more. Well over 100,000 people have read a Yale Guide.